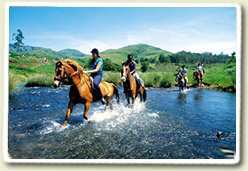 Carved out of the wilderness half a century ago, this Zululand village now offers country living at its best. The story of Monzi is a romance spanning the lives of three generations that tamed the floodplains of the Umfolozi river and infused a once largely inaccessible piece of land with their enterprising and adventurous spirit. It began in 1949, in the aftermath of the Second World War, when the government granted farms south of the present main road between Mtubatuba and St Lucia to 30 ex-servicemen, a pioneering group that would subsequently become know as 'The 49ers'. The farms were on a plain where the Umfolozi sent out watery tentacles and the land was covered with papyrus and reeds. Dorothy Hagemann, one of the two original 49ers still living in Monzi, remembers those first years. "Because the plain was regularly flooded, we had to build our homesteads on a piece of higher ground where each family was allocated eight hectares. There was nothing there to begin with, absolutely nothing. The same went for the farms, which were mostly covered in papyrus. Nobody had any money and so built themselves the most amazing little shacks. Ours was wooden with earth floors." On the 14 June 1949, the farmers gathered at the home of Rodney Adendorff to name the settlement. They decided on Monzi, after the stream that now crosses the fourth hole of the golf course. From then on the settlers started fleshing out a community. The Futululu Tennis Club, named after the nearby Mfutululu forest, was established in August 1950, and in November of the same year the Monzi Women's Institute started operating. Also in the same year, a single telephone with the number 1702 was installed at the MacNeillie's home, it being the closest property to the main road. This was Monzi's lifeline to the outside world, and everybody had to record their calls in an 'honesty book'. A Memorial Hall was built where meetings, dances, church services and concerts were held, but in January 1952 it was converted into a farm school with 11 pupils. Four years later the number of pupils had grown to 21, a figure that entitled the school to a government subsidy. Meanwhile, that little ball of white mischief had not been obliterated from the farmers' minds and plans were brewing to develop a golf course. The 49ers were allocated greens and fairways to establish and in April 1954, Springbok shottist M. T. Jackson officially opened the course. A simple structure did duty as clubhouse until 1962, when work began on a beautiful thatched-roof building. Periods of successfully cultivating sugar cane on the plains alternated with crippling floods every 10 to 15 years. Reporting on the 1955 floods, the Natal Daily News wrote that among the 40 devastated farms in the St Lucia district were 27 "belonging to soldier settlers (that) lie at the mercy of the flooded Umfolozi, many of these 10 ft under water." But gradually the farmers established a thriving cane industry and built themselves beautiful homesteads in Monzi, with deep green subtropical gardens and orchards of bananas, litchis and mangoes. When the government made more farming land available in 1986, new families settled in Monzi while some second generation sons returned to the fold, taking over existing concerns. In recent years, the charm of the hamlet and its lifestyle have attracted a handful of artistic and other interesting people. Today, Monzi might be considered a peaceful haven, but it certainly isn't a sleepy hollow. Sitting at the southern tip of the popular Elephant Coast, and right on the doorstep of the St Lucia World Heritage Site, it offers excellent recreational facilities to a growing number of visitors. Present chairman of the Golf Club, Kelvin Johnson, enthuses about the nine-hole course with its 18 tees, as well as the squash and tennis courts. Monzi's ladies have organised themselves into formidable catering teams and the golf club has become a favourite venue for weddings and other celebratory functions. Most locals are active club members and the clubhouse is the hub of Monzi's social life. A week typically kicks off with the menfolk hobnobbing together late on Monday afternoons, a ritual that has become known as 'the choir practice'. Alternate weekdays are given over to men's and women's golf, and the weekends are filled with fun activities for the families. From a high vantage point on the wall of the clubhouse, the mounted head of a massive white rhino known as 'The Headmaster' keeps a silent vigil on the merriment and mischief below. The head came from a rhino that escaped from Umfolozi (now Imfolozi) Game Reserve in 1953 and made its way to Mtubatuba, but then met a watery death when a makeshift bridge over the Umsinduzi river collapsed under its weight. The Monzi Planters' Association decided to have its head mounted and the school became the recipient of this unusual 'trophy'. When the school closed, The Headmaster was sent into retirement at the Golf Club. Canerat Crafts, a home industry shop run by a group of Monzi women, now operates from the old school building. An attractive selection of crafts, African souvenirs and lovely baked and bottled goodies is on offer and makes for an interesting hour of shopping and getting acquainted with the locals, after which you could enjoy a light lunch in the shady garden. From Canerat Crafts you might like to visit the Maywood Nursery and Serendipity Studio. 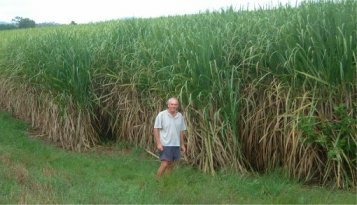 Robin and Sue Kirkwood are second generation Monzians who have channelled their creative flair and business acumen into venues other than cane farming. Twenty-three years ago they started cultivating palms on a small scale and today Maywood Nursery delivers 300 species of palms as well as a huge variety of tropical and indigenous plants to other nurseries and collectors. For the Van Rooyens, another 49er family, the lure of Monzi has brought a third generation daughter back from the cold climate of Ireland. Mother Tricia and daughter Paula recently pooled their artistic talents and opened a framing business named Serendipity Studio. Enter their premises and you are immediately caught up in the creative energy criss-crossing the room, the two women working as harmoniously together as pianists playing a duet. Everything they do is a creative project, be it box-framing a two-metre wooden African carving or a treasured collection of dinky toys. Over the years people with interesting stories have settled in Monzi. Paul Harrison, for example, chose to retire there after resurrecting a 4 000-hectare sugar estate on the banks of the Zambezi that had gone to ruin during the Mozambique Civil War. But his retirement didn't last because Paul and his wife, Brenda, are now growing frilly, crisp lettuce in tunnels, having proved sceptics wrong who said lettuces were too sensitive for Monzi's humid climate. Monzi is also where keen fisherman Peter Yeld came when he fled from the hustle and bustle of St Lucia in the 80s. And it's where his desire to build his own boat snowballed into Monzi Boat Builders, a father and sons business that has turned out more than 800 Yeld Cats in the past 20 years. An impish grin creases Peter's weathered face when he warns that he would have to ask you your age if you ordered a boat from him because the waiting list for his Cats is so long. With the advent of St Lucia's status as a world-class tourism destination, a number of Monzians became involved in tourism and nature conservation. Andy Lund's love of horses gave him the idea of conducting horse safaris into the park (because there are elephant, rhino and hippo, a fair level of horsemanship is required). The six-day safaris start out at Catalina Bay, explore the lakeshore, then move into the wilderness area for two days, ending in the coastal bush with rides on the deserted beach north of Cape Vidal. The logistics of Bhangazi Horse Safari are quite daunting. The horses are trucked in and out of the park and at night they are stabled in a huge shade-cloth tent. A back-up team sees to the watering and feeding of the animals, while Andy's wife, Kim, manages the camps and the catering side. The establishment of the Greater St Lucia Wetlands Park entails extending its borders and dropping fences to give the wildlife free range from the Umfolozi river right up to the Mozambique border. This will be a bonus for Neil Hopwood who, together with three partners, ventured into eco-tourism four years ago when they bought Futululu Park, just outside Monzi. The accommodation was upgraded and an environmental centre added. Clearing the land of alien vegetation took the best part of three years, but many small animals and a variety of birds have since returned to Futululu's beautiful environs and lakes, surrounded on three sides by the uninhabited and preserved Dukuduku forest. With Futululu's inclusion into the Greater St Lucia Park, the lakes will attract large game. Game-viewing is one of the biggest drawcards of the Elephant Coast and a great way to do it is from the air. James Hopwood, a commercial crop sprayer, takes visitors for the occasional flip over Monzi and the St Lucia Park in his Skywagon. Like other Monzians, he also gives freely of his time and skills to assist with conservation projects in the area, such as anti-poaching operations. Two days of getting under the skin of Monzi ended for me with a convivial gathering at the Cane Cutters restaurant in an old renovated homestead. On the veranda, friendly greetings and chatter drifted between the tables while children played on the stretched-out lawn and the balmy Zululand twilight enfolded Monzi - and a lifestyle that people dream of. Written by Anita de Villiers from Country Life Magazine - a very popular South African outdoor publication with a focus on Country living, traditional cuisine, crafts and places of interest.